Advantech has provided leadership for innovative Embedded Computing products and services for 30 years. 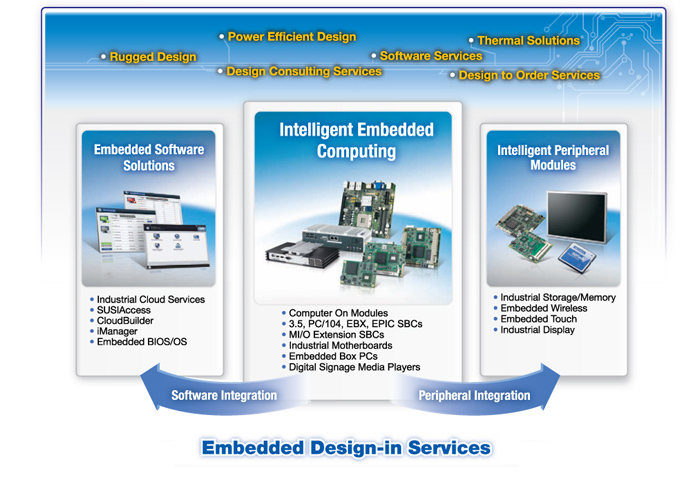 Advantech Embedded Core Services are integrated services that include a full range of embedded computing services including, innovative software services and a variety of peripheral modules with design-in services that help embedded developers design their applications even faster with lower risk. With comprehensive product ranges, customer-centric design services, and an extensive global network, Advantech is dedicated to helping customers develop reliable and innovative embedded solutions. We not only provide the latest embedded hardware computing products, we also think about how to provide more value to embedded developers through a variety of embedded design-in and software services.